Openly gay Jackie Biskupski leads Salt Lake City mayoral race. 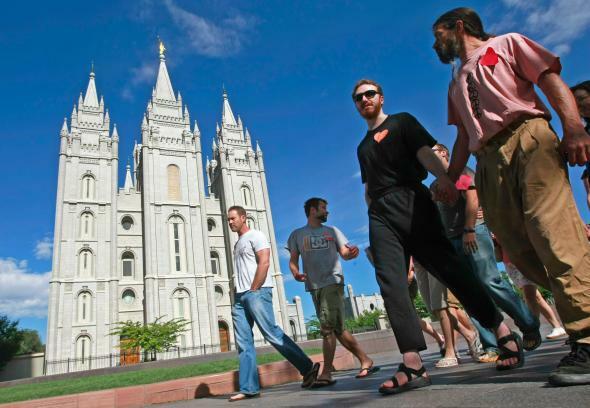 Gay rights protesters hold hands in front of the Mormon Temple on the Main Street Plaza in Salt Lake City, Utah. The election, however, is not yet a done-deal. Despite a 1,450-vote lead, the race was close enough that the several thousand mail-in ballots now being counted could prove decisive, though the Salt Lake Tribune says a change in the outcome “appears unlikely.” As of Tuesday evening, Biskupski had a 4-point edge on current city mayor, Ralph Becker, who is also a Democrat. The city’s mayoral election is non-partisan; state law stipulates the official results will be released on Nov. 17. That hasn’t stopped Biskupski’s LGBTQ supporters from celebrating. “If Utah can do it, anybody can do it,” Biskupski’s spokesperson said of the potential victory.